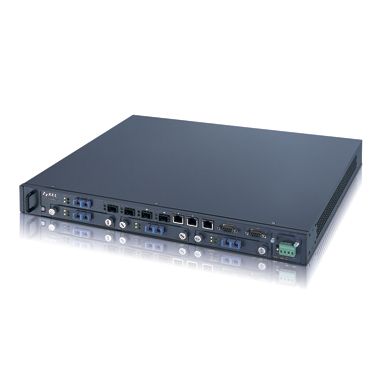 ZyXEL GEPON OLT 1308S-22 is a mini chassis with a Layer 2 GEPON switch featuring 8 GEPON ports (including 3 PON modules), 4 Gigabit uplink ports (2 copper and 2 combo ports) and one 10/100 Mbps Ethernet port for out-of-band management. 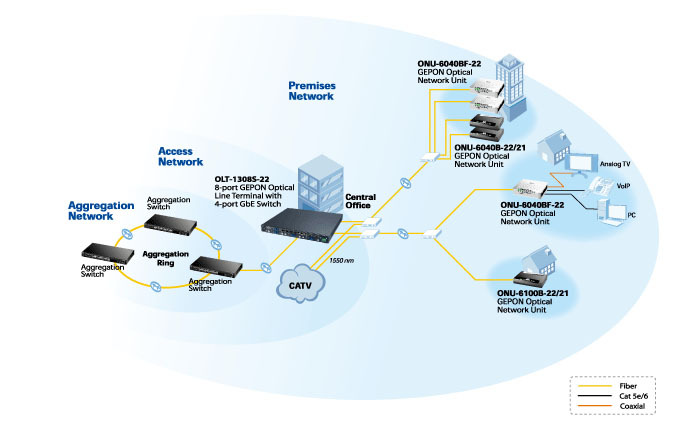 ZyXEL’s OLT-1308S-22 GEPON system (8-port GEPON Optical Line Terminal with 4-port GbE Switch) is located in the operator’s central office, while different types of Optical Network Units (ONU) are located at customer premises for FTTB/FTTH connections. 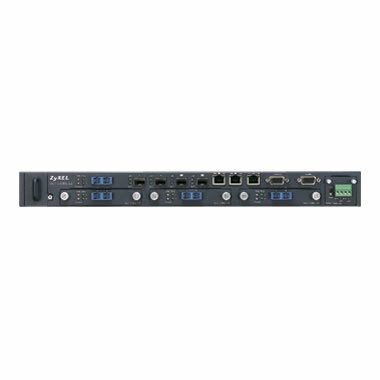 The ZyXEL GEPON OLT 1308S-22 is connected by a single fiber to an optical power splitter that supplies the optical signal to as many as 512 sets of ONUs (each OLT PON port supports up to 64 ONU sets). For CPE compatibility, ZyXEL provides several models for different network architecture needs. As demand for broadband services such as high-definition TV (HDTV), media-on-demand (MoD), Voice over IP (VoIP) and online gaming increases continuously, GEPON technology emerges to provide astounding 1.25Gbps bandwidth for both upstream and downstream, giving a 30Mbps bi-directional bandwidth to up to 32 subscribers each. It is a cost-effective access technology with a reliable and scalable carrier-grade Ethernet infrastructure that really addresses Triply Play service needs. Construction of the fiber access network is the most labor-intensive task in FTTX projects and thus the most expensive. However, PON architecture requires less cost since it requires less fiber. PON networks use splitters to allow minimal fiber deployment in local loops. In addition, it requires no power between CO and network’s termination that lead to lowered maintenance costs. On a PON network, subscribers must be within 20 km from the CO, depending on the total number of splits (distance decreases as splits increase). The OLT-1308S-22 supports a maximum distance of up to 20 km, and users can choose the different distances ONU type for 20 km deployment to adapt to the existing network structure. Since ONU can be added to or removed from the network architecture easily and economically, its great flexibility is perfect for the deployment of different network architectures. FTTH deploys ONU in residences, while FTTN/FTTC is the combination of fiber and existing copper infrastructure. In addition, administrators can upgrade firmware, test loopbacks and detect failures remotely. 3 open slots for GEPON modules, each module supports 2 PON ports.